Gwen Stefani has nothing but praise for new The Voice mentor Celine Dion. The My Heart Will Go On singer will help mentor Gwen's team of wannabes on the U.S. TV talent show's upcoming season this year (17), as she goes up against boyfriend and longtime The Voice judge Blake Shelton. Gwen is no doubt keen to have Celine on board after her man picked up his fifth victory on the show in December (16), when singer Sundance Head was crowned The Voice season 11 winner. 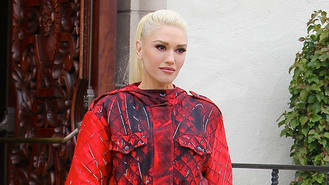 "She is like, the ultimate person that you would want to be on there," Gwen gushed to Entertainment Tonight (ET), as she paid tribute to the award-winning singer. "She is so unique… Every song she puts out is a world song, she speaks to the world and that's a whole other level (than), 'Oh I made it as a pop star in America.'" "She's (been) massive since she was 13 years old, so having her on the show was incredible," added the Hollaback Girl singer. Celine, 48, has thrown herself into her work since the death of her husband Rene Angelil in 2016, continuing with her long-running Las Vegas residency. She also had to cope with the loss of her brother Daniel - one of her 13 siblings - who also lost his battle with cancer on 16 January (16), just two days after her husband's death. Speaking to ET in Las Vegas on Tuesday (21Feb17) the singer opened up about joining The Voice - revealing the advice she would give to her younger self. "Be yourself and don’t be in competition with the world, be in competition with yourself," counselled Celine. "And don’t hold on to just one dream, because if you don’t make it are you going to tell me that this is the end of your life?... Life is more than a song, baby!" Chris Brown bowed out of his fight against Soulja Boy because there were too many middlemen wanting "a piece of the pie". The Chainsmokers' song with Coldplay has been confirmed on Spotify. Thom Yorke has reportedly found love with an Italian actress, months after the death of his ex-partner. Hip hop group Migos have been accused of beating up Sean Kingston in Las Vegas on Tuesday (21Feb17). Solange Knowles is set to perform at this year's Lovebox festival. Jennifer Lopez revealed she has a crush on Harry Styles during a game of Who'd You Rather with Ellen DeGeneres. Stormzy, The Flaming Lips and The Vaccines have been added to the Boardmasters festival line up.